Conic Intervention is designed to intensify and obscure the strange character of the Commercial Traveller’s Association. 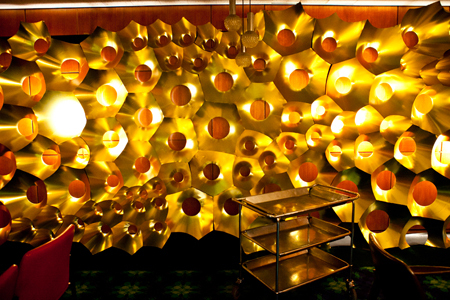 100 intersecting cones make-up the intervention, each of which isconstructed from mirrored foil. The material and geometry are in conflict with each other; the mirror reflects while the geometrydistorts. ROBERT BESON is the director of AR-MA. Educated in the United States and Australia, Robert holds degrees in literature, classics and architecture. As an architect, Robert has worked in Europe, the United States and Australia with a number of internationally recognised practices and institutions. His work has been exhibited at the Prague Quadrennial, Gwangju Biennial, and the Venice Biennale. In 2010, Robert was awarded the Byera Hadley Traveling scholarship for research on digital fabrication and production of complex structures. Robert has acted as art director and curator for academic institutions, and lectures at UTS and the University of Sydney. The proposed architectural intervention situated on level 4 (underground level of the CTA building) is based on the construction of a line work, using banal and temporal material (gaffer tape), as a spatial echo of level 8 floor plan (Thomas Demand exhibition). 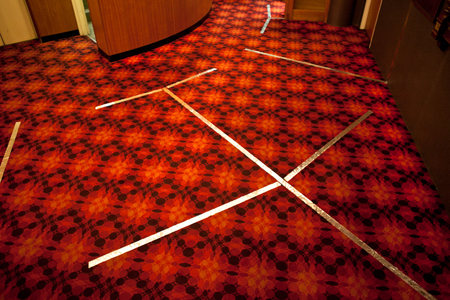 The created continuous lines on floor, wall and ceiling relate to the physical boundaries of the hotel rooms but do not act as traces. A third space of hybrid nature is created halfway between the absence and presence of two different spatial conditions (underground and superstructure). During the time of the event, echoed boundaries from level 8 will be turned into links gathering actions and spaces on level 4. FRANK MINNAËRT is a French architect, based in Sydney since 2005. He established a multidisciplinary design practice in 2006 which has received several design awards. Projects have been published and exhibited internationally including Venice Architecture Biennale - Pavillon de l’Arsenal, Paris - Federation Square, Melbourne… He has taught in Paris and is currently a Lecturer in the School of Architecture at the University of Technology, Sydney. The CTA building and its interior, unchanged since its opening in 1977, provide a surrealist, Lynchian setting. It forms a fitting parallel for the eerie, unpopulated photographs of Thomas Demand. 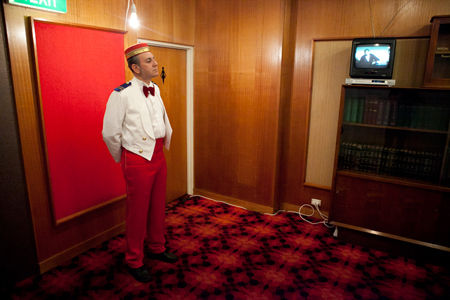 Proposition: Actors dressed to play the part of 1970s Bellboys stand in the subterranean hotel space at attention. They are motionless, mannequins. The surreality of these figures, combined with the décor of the CTA interior, evoke the uncanny nature of Demand’s work. NADIA WAGNER is a Lecturer in the Interior and Spatial Design department at the University of Technology, Sydney, and Co-director of ieoos.